Project obstacles and solutions: The Waterfront Development Corporation is an organization that has helped fund and refurbish the downtown shoreline in Louisville over the past 25 years. This included creating Waterfront Park, an 85 acre re-forested area along the Ohio River that hosts numerous civic events and celebrations annually. 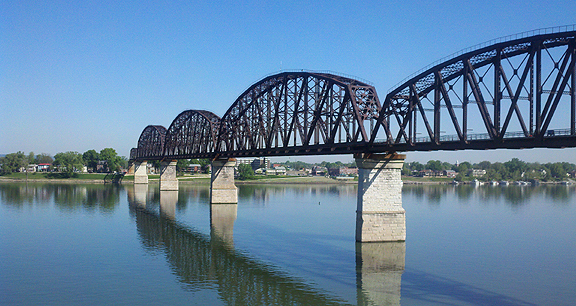 One of the last phases of the Waterfront Park project was to refurbish the Big Four Bridge, an abandoned railroad bridge, and convert it into a pedestrian and bicycle bridge between Louisville, Kentucky and Jeffersonville, Indiana. Both states agreed to pay for portions of the repurposing of the bridge and construction began in 2011. The Big Four Bridge was originally constructed in 1883. The bridge was reconstructed in place in 1923 and supported daily traffic until 1968, when the railroad ceased using it. The access ramps were removed in 1969. The steel structure has been unused and left to decay over the past four decades. Reworking the bridge fit nicely into the long-term strategic plan of the Waterfront Development Corporation and would open more access to the park. T&C Contracting won the bid to resurface the bridge. The engineering plans called for the removal of the old wooden ties and supports. These were replaced with pre-cast concrete panels which were mounted on the steel structure. The finished surface would be paved with three inches of concrete that capped the panels. The concrete was specified to contain KIM to waterproof the concrete and polypropylene fibers to control cracking. This called for a special concrete mix that could maintain its slump and entrained air. Using KIM in concrete can reduce air entrainment and cause freeze and thaw problems with the concrete. It also can impact the workability of the concrete. IMI’s QC/QA personnel in Louisville engineered a concrete mix that met specs and also sustained slump and air entrainment. Concrete workability became a key to the success of this project. Once the concrete was delivered, it was pumped 55 feet onto the top of the bridge ramp on the Kentucky side of the river. It was pumped into two short mixer trucks atop the bridge – four yard mixers - and then transported 2,500 feet to the start of the placement. IMI delivered 470 yards of the special mix concrete for the project. It was finished in five days. Both Kentucky and Indiana residents will have access to the bridge in the summer of 2013.